In our latest installment of contender profiles for the 2013 Kentucky Derby, we’re going to look at Flashback, one of the many horses to emerge from the Bob Baffert camp. Owned by Gary and Mary West – the Kentucky-based duo that currently has a stable of over 54 horses in training – Flashback sits fifth in the Kentucky Derby points standings, with 30 right now. The reasons so many are gravitating towards Flashback as we gear up for the Derby are obvious. 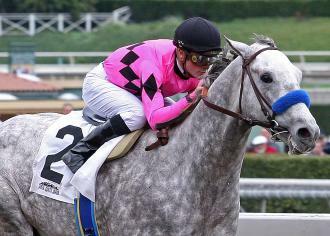 In Baffert, you’ve got the premier trainer on the market. The man took the horseracing community by storm in the late 90s by sending Silver Charm and Real Quiet to Derby victories in 1997 and 1998 respectively. Four years after Real Quiet’s victory, Baffert was once again in the limelight as another of his horses, War Emblem, captured the Kentucky Derby in 2002. That said, it has been a while since Baffert’s captured the Run for the Roses – 11 years and counting. This is another reason why folks are so high on Flashback heading into May 4; his natural ability, teamed with Baffert’s desire to be back in the winner’s circle, makes for a very dynamic combination. Flashback has shown well as of late. He captured the Grade 2 Robert B. Lewis Stakes at Santa Anita in early February and this past weekend, got into a heated affair with underdog Hear the Ghost at the San Felipe Stakes, which was also run at Santa Anita. Baffert didn’t seem too fazed by the way the race finished. Hear the Ghost rallied late down the stretch to pass Flashback and Goldencents to win by a half-length, something Baffert chalked up to a learning experience. While Baffert was demure in his post-race response, the wagering community was much more effusive. According to the Louisville Courier-Journal, Wynn Las Vegas oddsmaker John Avello dropped Flashback from 11-1 to 9-1 for the Derby – a significant drop, though nothing compared to Hear the Ghost, who plunged from 60-1 to 15-1. As for what the future holds for Flashback? The big question will be whether or not he’ll run at the Santa Anita Derby on April 6. It seems more than likely Flashback can qualify for the Derby based on the 50 points currently in the bag, but there is something to prove in running another race – Baffert could want to move past the “learning” phase and have Flashback fully prepped in time for May 4.